Disney just announced that the Star Wars areas of their theme parks will be called Star Wars Galaxy's Edge. The studio also gave a few more teases of how this highly interactive land will work. Also opening: the world's first totally immersive Star Wars hotel. A few months ago, Disney employees hinted to fans that actions would have consequences in the lands. We didn't quite know what that meant — but at D23, Imagineers explained a bit more. For example, you may see Chewbacca around talking to Hondo. They're up to no good and could be recruiting a group of people to go on a mission. So then you'd go on the Millennium Falcon ride, one of two in the park. Based on how you and your crew does on that ride (the ride will allow each individual person to have their own job aboard the Falcon), you could get some extra republic credits afterward, or maybe a stern talking-to. If you're really, really bad though, bounty hunters might hunt you throughout the park, like a new one named Harcos. There will also be a Cantina — it was a hinted there may be booze there — and the music will be courtesy of a new DJ. It's Rex, the former pilot of Star Tours. That's just one example of how things will work. However, another major announcement has to do specifically with the Walt Disney World Resort in Orlando. There, it was announced, Disney is planning a 100 per cent immersive Star Wars hotel. That means everyone there will act like they are in Star Wars. You become a citizen once you check in, and every minute of your experience will be Star Wars. You may even have the option to dress up as the character you want to be. The photos you see here are of that. Apparently, you are part of the story every minute you are at the hotel for your entire stay. Which, frankly, sounds a little scary. What if I want to sleep? 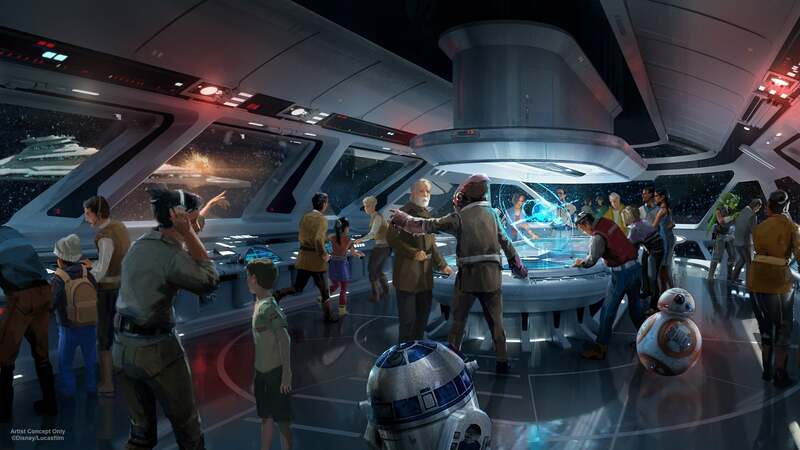 We'll have to wait and see exactly what this entails, but the concept art shown was pretty badass, including the fact that every room at the hotel will have a view into "space." While both Star Wars Galaxy's Edge parks will open in 2019, the one at Disneyland in Anaheim will officially be first.